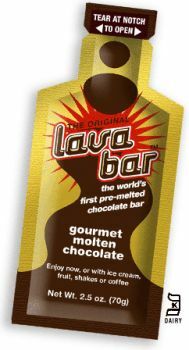 Touted as â€œthe worldâ€™s first pre-melted chocolate bar,â€ the Lava Bar is â€œgourmet molten chocolateâ€ in a 2.5 oz golden foil-like pouch. It is not chocolate syrup, though it can be used like chocolate syrup on ice cream, fruit, shakes or coffee. To soften the chocolate and really make it fluid, you need to submerge the Lava Bar in hot water first. It canâ€™t be heated in the microwave, probably because of the packaging. Despite its claim to be a pre-melted chocolate bar, it really wasn’t. It’s more like hot fudge in a foil pouch, not like a melted Hershey chocolate bar, which is what I was expecting. The texture is a bit grainy and it tasted more like fudge batter, and less like a chocolate bar that has been melted. Once you understand what it is and what it isn’t though, it’s pretty darn good. I really would have preferred a richer chocolate taste, like you might find in a molten chocolate cake. I found it tastes better on ice cream than by itself, so I think it might be best as a sauce or flavoring for a coffee, than as a chocolate bar alternative. I’m not sure it’s something I would ever actually buy instead of a candy bar, but it’s definitely an interesting idea and worth at least one try. It just needs a little tweaking in the taste department if it wants to replace my regular chocolate bar. Now having said this, I had a chocolate tasting at work and the Lava Bar was one of the chocolates we tasted and many of the people said the Lava Bar was one of their favorites and asked the name of it again so they could be on the lookout for it. So, it’s quite possible you might like it more than I did. I had seen an ad for these and been curious! It was fun to read your writeup. I don’t know if I need to invest myself now…but it did satisfy some of my curiousity! One of our intentions behind the Lava Bar’s portion-controlled pouch is this: How many times have you bought a jar of hot fudge, enjoyed it the first night and then thrown out a half empty jar 6 months later when you find it in the back of your refrigerator? If you are like me, it happened a lot. So, the idea for the Lava Bar is that you put a box of 12 Lava Bars in the pantry, and each time you want a hot fudge sundae, you just pull one Lava Bar pouch out of the box and warm it. Ta-da! No waste. I don’t know about you, but we’ve noticed a lot of people eating hot fudge right out of the jar. So, if you are one of those folks, you’re definitely going to love the Lava Bar. Thanks also for reminding users to warm the Lava Bar in hot water before use. That’s what I always do, and it is what I always recommend strongly. Lastly, please know that we are a tiny, family run business chasing a dream, so we really, really appreciate your support! I got to sample these when I won them off this very site. My fiance has a HUGE craving for them now and I can’t find them anywhere, even the site doesn’t work anymore. This has made us both very sad.